Oak savannas (sometimes called oak barrens or oak openings) are transitional habitats between tallgrass prairies and oak forests. They tend to be very diverse because they contain both forest and prairie species. Oak savannas are maintained by periodic fire, which encourages oak regeneration but keeps most other trees out. The result is a park-like setting with abundant grasses and wildflowers and a few scattered large trees. In the past, fires would start naturally by lightning or intentionally by Native Americans. These days, we maintain oak savannas with prescribed burns. Our spring prescribed burn season is about to kick off, which means some of our preserves will be looking a little scorched. But with the charred earth comes the opportunity for a rare Michigan habitat to be restored. Ecologists are fascinated by oak savannas in part because they’re exceedingly rare. The oak savanna was once one of the most prevalent ecosystems in the midwest. Far less than one percent of the original oak savannas in Michigan remain—mostly due to conversion to agriculture. Those that escaped the plow have undergone a century or more of fire suppression, effectively wiping out the fire-dependent plants and animals that once lived there. It’s no surprise that many of the plants and animals that depend on oak savanna habitat are also now very rare or endangered. Take for example the federally endangered Karner blue butterfly. Karner blue require wild lupine for part of their life cycle, and wild lupine is a fire-dependent, oak savanna-specific species. West Michigan is one of the last strongholds globally for oak savannas and Karner blue. There is a lot of regional emphasis on working towards its recovery, especially since Karner blue is a species that is particularly vulnerable to climate change. 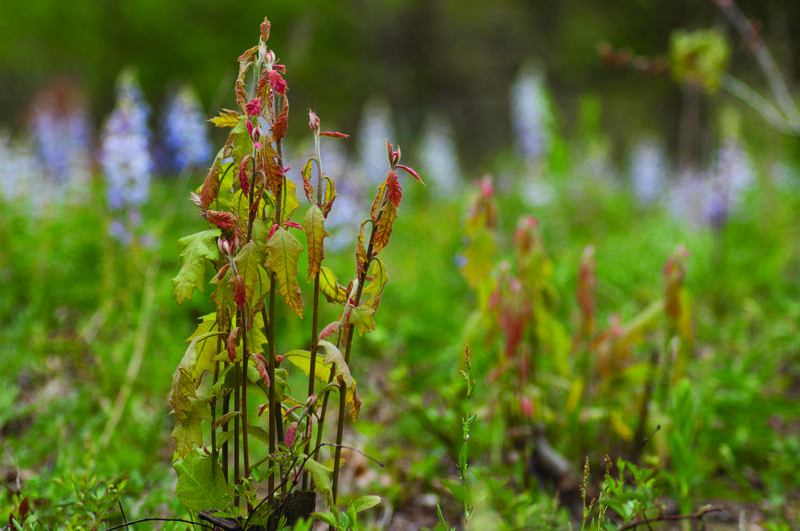 The Land Conservancy recently kicked off a region-wide effort to restore Karner blue and oak savanna habitat with a diverse set of partners including the Michigan DNR, U.S. Forest Service and National Wild Turkey Federation. This work includes restoring and expanding oak savanna remnants on several of our nature preserves and conservation agreement properties. You can view oak savanna restoration projects on the following of our preserves: Brower Lake Nature Preserve, Bradford-Dickinson White Nature Preserve, Maas Family Nature Preserve, Wege Foundation Natural Area.